Glasgow’s released Scotland players helped bring their side this crucial victory which puts them right back into contention at the top end of the Guinness Pro12. The two tries were scored by centre Alex Dunbar and stand-off Duncan Weir, the second coming just eight minutes from the end of a game which had ebbed and flowed throughout. Weir’s effort followed a break down the right-hand side by No 8 Josh Strauss, while the pass back inside was examined closely by the video ref before the hands were adjudged to be level. It was enough to claim a victory as Glasgow had their nervous moments in the closing minutes but were able to close it out. Glasgow may have been languishing in eighth place in the league before this match, but they have a couple of games in hand so playing this early in the Six Nations weekend actually had the potential to give their league position a more realistic feel. 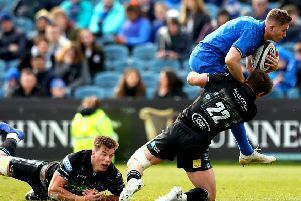 They jumped to fifth, inside the top six European qualification places and also getting close to challenging for the top four that will remain the target of the defending Pro12 champions. After the recent bad weather in south Wales – and the decision to play a club game on the pitch in the middle of the storm – there was 40 tons of sand laid to cover the boggy areas. Given the recent issues at Scotstoun, that might have helped the Glasgow players feel at home. However it was the Dragons who started strongly, keeping possession until they earned a penalty under the posts converted by Angus O’Brien – showing less Celtic brotherhood than the name would imply. Glasgow’s efforts to get into the first half were hampered by regular handling errors. It was a cold night, but that was not a great excuse for professional players. It was a strange first half in that both sides tried to play with ball in hand and were capable of making ground in the middle areas, but each seemed to face a brick wall in defence once the line was close. As a result it was all kicks on the scoreboard, four in all for O’Brien while Duncan Weir notched a couple for Glasgow as well as missing a drop goal attempt just before the half-time whistle blew. Glasgow opted to put a kickable penalty into the corner at the start of the second half and were rewarded when the line-out drive put the home team under pressure and centre Alex Dunbar was able to burst through from a Mike Blair pass 10 yards out to reach over the line for the score. Weir converted to put Glasgow ahead. An O’Brien penalty put the home team back into the lead, but Glasgow again were confident enough to kick for the corner instead of at goal and seemed to have been rewarded again when replacement prop Gordon Reid, another released by Scotland, sneaked over the line. However he was deemed to have come from an offside position and the Dragons cleared their lines with their lead intact. It was a temporary reprieve, as Strauss and Weir combined to put their side back ahead and they survived the nervous finale.